The background of the flag is yellow/golden in color, which signifies the Monday birth of the king. Yellow/golden is considered a lucky color for Monday in Thai culture and many citizens will wear yellow to honor the king until his passing. In the center of the flag, there is his personal cypher made up from the Thai characters "ภ ป ร" (B P R equivalent in English), which eludes to Bhumipol Rex. Above the cypher, the Great Crown of Victory is displayed. This crown is only worn during the coronation and will be seen again when King Rama X (Crown Prince Vajiralongkorn) is officially installed. Between the cypher and the Great Crown is the "unalome" figurine; it is rooted in Buddhism and is used as a mantra. There are variants where the "unalome" symbol was replaced with the Thai number nine " ๙" to denote he was the 9th monarch of the Chakri Dynasty, However, those variants are few and far between. You can find the information about the flag at this website. The emblem has the Royal Crown in the middle, resting on a pedestalled gold tray, radiating golden rays. The whole object is situated on a celestial abode. There is the Thai numeral 9 between the Royal Crown and the tray, signifying the 9th Reign. The mythological lion and half elephant-half lion figures are featured on both sides of the tray, supporting the royal umbrellas. The inscription underneath says: Silver Jubilee 9 June 1971, the 25th Anniversary of His Majesty the King's Accession to the Throne. According to a 2016 article by the Public Relations Department, the designer is unknown for this emblem and there is no evidence that the emblem was used on flags. Judging by future history, my guess is that it was designed by the Fine Arts Department. The Royal Garuda signifying the State, meaning the Government and the People, respectfully supporting the discus and the ancient sword, symbolizing the Chakri Dynasty and His Majesty King Bhumibol Adulyadej. The clockwise discus signifies the power of righteousness. The Royal Crown with golden rays, flanked by royal umbrellas and royal belongings, signifies the power of the monarch. The mythological lion symbolizes the civilian side, and the mythological half elephant-half lion figure symbolizes the military side. They hold the royal umbrellas and the royal belongings, signifying the two branches of officials that undertake state affairs in the name of His Majesty the King. The Royal Seal, as an eight-sided fig-wood royal throne under the seven-tiered royal umbrella. The royal discus with flames is featured on the throne, with the symbol of auspices in the middle of the discus, symbolizing His Majesty the King's great power of kindness and benevolence that reaches all directions to protect his subjects. The five royal regalia and the Thai numeral 9 signify the longest and most prosperous of the 9th Reign, the longest reigning monarch in Thai history. Rare the First King IX Flag Thailand. This is about 20 years olds for This flag. It is First version of King IX flag. This flag begin to use when King IX be a great king of Thailand. This Flag use in front of The King IX car. It is 5.50" x 9.0" [14 cm x 23 cm]. It is in good condition come with pastic [sic] cover. Is this just a promo flag? Or is it a royal flag? This flag was identified by my friend Naphat Amkum in Thailand as an unofficial supporters flag. The flag is golden yellow, which signifies the King's birthday on a Monday. A drawing of the king is placed below his personal cypher and the Great Crown of Victory. The scroll that is underneath him reads "King Bhumipol the Great" and the text on the bottom right says December 5th, the date when the king was born. The design of the middle of the flag would normally be see on highway and street displays when it is close to his coronation date or his birthday, but the depictions have been removed since his passing in October (unless he is pictured with his wife, Queen Sirikit). From a 1987 visit by the King to Mahidol University. The King's flag I recently saw in Thailand was quite different from the royal standard in FOTW (Garuda on yellow background). The King's flag is his crown shape and his Thai character initial in red below on bit [sic — 'field'?] dark yellow. The shade of yellow is the same as of Thai Monks clothes or that used in the Sri Lankan flag. I recently brought back this flag from Thailand. It is a simplified royal flag, reminding a bit of the below unidentified flag. 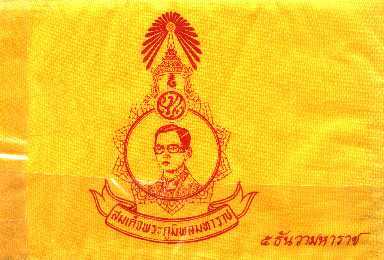 The personal standard of H.M. King Bhumipol Adulyadej (Rama IX) is a dark yellow flag with his emblem. The flag contains the Royal Insignia of King Rama IX, together with the coat of arms of the Chakkri Dynasty, above which hovers a crown symbolizing the Chakkri Monarchy. In addition, there is a double-tiered royal chalice-carried by two white elephant covered by a white canopy. The flag itself honours both his Majesty the King and the Chakkri Dynasty as a whole; not only does it demonstrate the pride which the Thai people take in having such a talented monarch-one who has ruled the country for over 50 years; it also celebrates the nation itself, its long and distinguished history and its unique art and culture, as well as the national character in general. Elephants were royal carriers, symbolizing the loyal Thai subjects who serve their monarch. White elephants are, according to the old belief, the symbol of might, wisdom and prowess, befitting a great monarch. Elephants are national symbols, once portrayed on the national flag. They represent long life, comparable to the long history of the Thai nation." I recently brought back this flag from Thailand. It was identified as a royal flag. This is yet one more of King Bhumibol Adulyadej a.k.a. Rama IX's personal flags, since it bears his cypher. What for and when is each flag used still remains obscure. Nozomi mentioned that some of this flags are used to salute the king (at parades etc.) but also by the king himself. And of course there is also the royal standard. His Majesty the King's initials the Thai letters "Phor Por Ror" placed at the centre of the crest, under the Royal Crown and above the Royal Throne of the Eight Compass Points, signify that His Majesty is the focus of the entire nation, binding the people's hearts and loyalty. The yellow colour of the letters is the colour of His Majesty's day of birth, and the blue colour of the background that of the monarchy. The surrounding discus (Chakra) with the Thai numeral 9 means that King Bhumibol Adulyadej is the ninth monarch of the Chakri Dynasty. The crest is flanked by two seven-tiered umbrellas and topped by a nine-tiered umbrella, both types symbols of kingship. The four point border represents the four regions of the country, in which the people live in peace and tranquility under the King's supreme protection, as expressed by the green colour, which is a symbol of peace and abundance. Each of the four points of the border has a lotus, an offering to His Majesty on the occasion of his Sixth-Cycle Birthday Anniversary. The golden rays around the crest signify His Majesty's grace and benevolence, which pervade the Kingdom and beyond and bring pride and joy to the people in the entire land. Beneath the crest a blue silk banner bears the inscription of the Royal Occasion of His Majesty's Sixth-Cycle Birthday on 5 December 1999. His Majesty the King's initials, placed under the Royal Crown and above the eight-sided Royal Throne, signifies that His Majesty the King is the focus of the entire nation, a unifying force who commands the deepest love and respect among his subjects. The letters are in yellow, the colour of the day of His Majesty's birth, Monday, against the background of deep blue, the royal colour. This is surrounded by the discus-emblem of the Chakri Dynasty and the Thai numeral 9, signifying the 9th Reign of the Chakri Dynasty. The crest is flanked on both sides by seven-tiered royal umbrellas, and topped by the nine-tiered royal umbrella. The border is divided into four parts, representing the four regions of the country, in green, the colour of peace and abundance. A lotus is featured on each of the four points, as an offering to His Majesty the King on the occasion of His Majesty's 6th Cycle Birthday Anniversary. The golden rays around the crest signify His Majesty the King's grace and benevolence, recognized throughout the Kingdom and beyond. Among the photos posted today in the Doha Asian Games website was one in which Thai spectators cheered on their badminton team. There was a Royal Thai flag being waved; it is on FOTW as an "Unidentified Flag of King Rama IX, 2001" [Ed. : since identified]. Could it be a royal flag approved for general public use, denoting loyalty to the King and/or patriotism? Indeed these are flags denoting loyalty to the King, and not a "Royal Standard" in the normal sense. This special emblem for the 60th anniversary of King Bhumibol Adulyadej's accession to the throne was designed by Somchai Supalakumpaiporn, an artist in Thailand's Fine Arts Department, and chosen by the king from 12 designs that were submitted. There are several symbols in the emblem. The centerpiece is an abbreviation of the king's name in golden yellow, the color of Monday, his day of birth. The abbreviation is set on a blue background, which is the color of the monarchy. It is encircled with diamonds, which symbolize wise men, important authors, craftsmen, elephants, graceful women, soldiers and courtiers who serve the monarch. The Royal Cipher is depicted on a throne and surmounted by the royal crown. On the sides are the king's sword and staff, in front of the fan and yak's tail whisk. Under the throne is a pair of slippers. These five objects are used in coronation ceremonies, are are the same as those used in the king's coronation in 1946. The bottom of the emblem features a pink ribbon trimmed with a gold inscription, "The Sixtieth Anniversary Celebration of His Majesty the King's Accession to the Throne BE 2549." The two ends of the ribbon are held by the monkey god Hanuman, Phra Ram's vehicle in the Ramayana, and a garuda, the Hindu god Vishnu's vehicle. The green and gold colors in the background represent the fertility of the land. This image was submitted to the press for use in stories about the anniversary celebration, and will be used to illustrate Wikipedia articles about the monarch and the celebration. Source: Keenapan, Nattha (June 9, 2006). "A Symbol Of Greatness," International Herald Tribune/ThaiDay (print edition). "There are soft yellow on the Thai letters Bhor Por Ror. The yellow color of the letters is the color of His Majesty's day of birth and a gold color has been a line around with mixing between blue and gold background. Also there are diamonds around the monogram that represent the king as a man of learning, poet laureate and famous craftsman. Therefore the king seems to be a diamond of the Thai people, the topmost of precious stones. His Majesty the King's initials are placed under the Royal Crown. There are 5 symbols: a crown, a "chaisri" royal sword, a king's walking stick, his fan, his shoes, all representing the Anniversary of His Majesty the King's Accession to the Throne. Below The Royal Ceremonial Emblem there is a pink silk ribbon bearing the inscription "on the 60th Anniversary of His Majesty the King's Accession." To the right end of it there is a monkey, to the left a garuda. All of the Royal Ceremonial Emblems have to contain the mixture of green and gold colors, signifying power and fertility." It was designed by Mr. Somchai Suphalak-amphaiphon (สมชาย ศุภลักษณ์อำไพพร), an artist from the Fine Art Department of Thailand. Visible in a Yahoo photo of flags being waved at the end of a march to encourage people to vote in a constitutional referendum in front of the Democracy monument in Bangkok, 13 August 2007. "The Royal Emblem depicts the Privy Seal of the Ninth Reign, which is composed of the Octagonal Throne, the Discus (Chakra), in the middle of which is the symbolic letter "Unalome" insignia. Around the Chakra Discus, there are rays radiating all round. Above the Chakra Discus is the Seven-Tiered Umbrella over the Octagonal Throne meaning that His Majesty the King has sovereign power in the realm, for at the Coronation Ceremony His Majesty sat upon the Octagonal Throne and received consecrated water from the eight cardinal points in accordance with ancient Royal custom which for the first time was presented by Members of Parliament instead of Royal pundits. As for the platform on which rests the Octagonal Throne, it is strewn with nine silver and golden "Bikul" flowers. The Privy Seal is encircled by eighty diamonds meaning the 80th Birthday Anniversary. On top of the Seal is the Great Crown of Victory which signifies the Royal Dignity of the Sovereign and symbolizes supreme Kingship. Within the Great Crown of Victory is the Thai numeral 9 meaning the Ninth Reign. The Great Crown of Victory is in front of the Great White Umbrella of State, which is in the centre and flanked by two Seven-Tiered Umbrellas, marking the great rank of the Sovereign. Beneath the Privy Seal is the Thai number 80 meaning that His Majesty the King has reached His Eightieth year. Under the number 80 is the silk ribbon bearing the words "The Celebration on the Auspicious Occasion of His Majesty the King's 80th Birthday Anniversary 5th December 2007". Apart from naming the Royal Ceremony, the silk ribbon also supports the two Seven-Tiered Umbrellas." A brief history on how the emblem was designed (in Thai): https://my.dek-d.com/marina_rain/writer/viewlongc.php?id=247173&chapter=318. Out of the designs submitted, Sumet Putpuang (สุเมธ พุฒพวง) was chosen as the artist by King Rama IX. "His Majesty the King's initials - Pho Po Ro - in the middle of the royal crest are in golden yellow, signifying the day of birth of His Majesty. They are bordered in gold on a blue background, surrounded by a circular frame in golden yellow, signifying that His Majesty the King is the centre of Thai hearts throughout the country. Above the royal initials is the number 9, meaning the ninth monarch of the House of Chakri. The number is under the Great Crown of Victory, one of the royal regalia and a symbol of the reigning monarch. The royal initials are flanked by two lotus-bud tops in gold under the seven-tiered umbrellas of state. On the outside of the lotus-bud tops, and circling behind the initials, is a curved frame with designs in gold on a green background, the colour of might, representing the birth of His Majesty and also meaning fertility and peacefulness. Below the royal initials is a white running rabbit, which means the auspicious occasion of His Majesty's 7th cycle birthday anniversary, coinciding with the Year of the Rabbit. The rabbit is featured on a blue background, with a running scroll design, meaning the progress of Thailand under the auspices of His Majesty the King. Underneath is a gold-bordered pink ribbon, emblazoned with the title "The Celebrations on the Auspicious Occasion of His Majesty the King's 7th Cycle Birthday Anniversary 5th December 2011." Out of 112 entries, the design by Siri Nudang (นายศิริ หนูแดง) was chosen by the King to be used for the ceremonies. Here is how Mr. Nudang describes how he came up with the emblem, along with history of other emblems and concept art. The initials of the King are placed on a blue background; this background is surrounded by a gold ring. On top of this ring, it sits the emblem "ohm" also in gold. To the sides of the emblem are weapons that form the Royal Regalia, the Sword of Victory and the Royal Staff. At the bottom of each weapon, there are the Royal Slippers. Underneath all of this is the Thai characters for "70" and the name of the event is put on a pink ribbon in gold. To top off the emblem, the Great Crown of Victory is placed. It was designed by Mr. Somchai Suphalak-amphaiphon (สมชาย ศุภลักษณ์อำไพพร), an artist from the Fine Art Department of Thailand. From the time of his passing in October 2016 to the cremation last month, there was one main flag used to honor King Bhumibol Adulyadej. While this was unofficial in nature, the government called for a year-long mourning period and this flag helped serve the purpose to mark it. This flag, sold by flag shops, has the character "9" in white above the text "May HM the King go to heaven." This character above the text is to signify that Bhumibol Adulyadej was the Ninth King of the Chakri Dynasty. These were not used in the official ceremony for the cremation.